This article was first published on Ahram Online on 4 February 2012. Renowned economist and former deputy prime minister and minister of finance, Hazem El-Beblawi, discussed his newly released book, Arba Shohour Fi Qafas Al-Hokouma (Four Months in the Government’s Cage) at the Cairo International Book Fair. The book tells the story of his term in office from July to November 2011, as minister of finance and deputy prime minister for economic affairs. El-Beblawi, 75, is considered among the world’s most respected economists for his rich and long experience. His four months in the Egyptian cabinet following the January 25 revolution came at the time when the economy was undergoing a crisis that sapped its financial liquidity, reducing by almost half Egypt's foreign exchange reserves. “The book is documentation of the decisions I made while in office to save the economy. 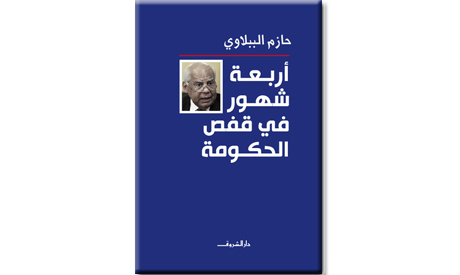 When I was in office I had no idea or intention to write this book, but since I believe that the decisions of the time can still be effective and deal with Egypt’s core economic problems, I decided to record everything in a book,” El-Beblawi explained. Following the January 2011 uprising, the economic situation was blurred and complicated, while expectations rose enormously, according to El-Beblawi. People thought that most of their daily life problems would be solved by ousting a corrupted president and his gang, but things didn’t go that way. “I had to clear things out and to define my priorities, first things first, and to tell the people that fixing the situation would take years,” El-Beblawi said. The first task El-Beblawi had to embark on was stemming the downward push on liquidity in the economy; lack of liquidity would choke the economy as a whole, lead companies to declare bankruptcy, and put at risk the ability to import basic need commodities. “Egypt's imports cost $50 billion, mainly oil, wheat, medication and spare parts, while our exports are only $25 billion. The gap is compensated usually via tourism and foreign investment, that retreated badly this year. So liquidity was my top and urgent priority,” El-Beblawi said. The former minister and academic speaks in his book of the promises offered by Arab to pump liquidity into the Egyptian economy, promises that went unkept. Saudi Arabia paid $500 million and Qatar a similar amount, but they did not continue the aid because of instability in Egypt, he said. The book doesn't only tackle economic issues, though they occupy the larger share. El-Beblawi also speaks of his political stances in office, including his resignation following the Maspero massacre, in protest at the government's handling of the crisis. El-Beblawi also described the Egyptian budget as "abnormal," as its deficit jumped to 27 per cent, meaning that Egypt lacks resources for 27 per cent of every pound the government spends. "Some 55 per cent of budget items go to things we do not make use of; 22 per cent is devoted to debt payment, and 33 per cent to energy subsidies. And the deficit is projected to be higher in the next years," El-Beblawi noted. “Egypt is a country without natural resources; the only resource we have is humans. This fact means a demographic growth rate that doubles Egypt’s inhabitants every 30 years is not an option anymore. It will lead us to a disaster," El-Beblawi said. Firmly criticising the stands taken by some figures in the current Egyptian cabinet, refusing loans from the International Monetary Fund (IMF) by claiming they would impose certain policies on Egypt and interfere with internal affairs, Beblawi denies that such loans were conditional, seeing IMF loans as a means to strengthen the economy and allow Egypt to repay its debts. “Loans are not bad. This culture has to change. Even if we take loans from Egyptian businessmen and banks, they remain loans. On the contrary, borrowing from Egyptian banks gives them the chance to make higher profits without investments,” he explained. El-Beblawi surprised the audience in repsonse to a question concerning the $9 billion Hosni Mubarak allegedly deposited in a private bank account, saying that the $9 billion is included in the annual foreign exchange reserve report as a second tier; that its origin dates back to the 1991 Gulf War, when Western countries — particularly the US — gave aid to Egypt for its role in liberating Kuwait. The original sum was $4.5 billion, kept by Mubarak in a private account as a reserve for times of crisis. The renowned economist ended his speech underlining that Egypt has to look for new resources, such as developing solar energy research, adding that the only way to raise production in Egypt is via technology. El-Beblawi makes it clear in his book that Egypt will face a dangerous liquidity crisis ahead if action is not taken, advising the Egyptian cabinet to stem the "bleeding" of the economy, which he described as a body that lacks blood, criticising the lack of information given by the cabinet and in the media. The question stands whether anyone will listen.